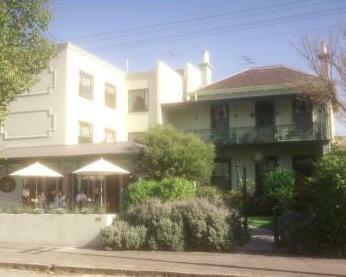 Magnolia Court Boutique Hotel East Melbourne is conveniently located close to the MCG and Melbourne city centre in the quiet, leafy district of East Melbourne. Magnolia Court is an independent family-run hotel accommodation. Hosts Gary Lu & Yun Hu, together with our small but dedicated hospitality team, operate a quality bed and breakfast accommodation in East Melbourne. Elegance and charm Tucked away in gracious, East Melbourne. Set amidst prestigious and leafy historic houses a few minutes walk from Fitzroy Gardens reflecting the grand old streets from the days of the lucky strikes in the Goldfields . The transition from residential quiet to downtown shopping and entertainment is virtually seamless. Hotel Address : 101 Powlett Street, East Melbourne, 3002, Victoria. Situated directly to the East of the city centre the suburb of East Melbourne is surrounded by parklands which makes it a quiet and relaxing place to stay, however it is still just a short walk or tram ride to the Melbourne CBD, Southbank and Yarra River precincts. To view a larger and more detailed map of East Melbourne simply click on the smaller map on the left hand side of this page. Melbourne Cricket Ground (MCG) - Famous for all top cricket and football events and concerts. Rod Laver Arena & Melbourne Park Tennis - Home to 26 tennis courts as well as the Australian Open Tennis Championships. Olympic Park - A sports complex with soccer, rugby, basketball, athletics, and concert facilities. Crown Casino Entertainment Complex, Southbank - Vibrant area with unlimited entertainment and dining choices. Queen Victoria Market - The largest outdoor market in the world with over 1000 traders on display. 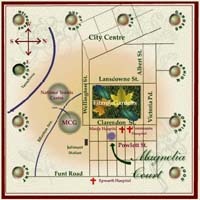 Items include food, fashion, plants, crafts, souvenirs and fresh produce. Melbourne Zoo - An internationally acclaimed zoo that takes great pride in recreating the natural habitats of its precious animals. Old Melbourne Gaol - Victoria's oldest surviving penal establishment depicting prison life in the 19th Century. Displays include the death masks and memorabilia of some of Melbourne's most notorious criminals. IMAX Theatre - Home to the world's biggest screen. Take the journey of discovery with state of the art technology and crystal clear images. State Library of Victoria - The largest reference and research collection in Victoria, containing over a million books and journals, a large newspaper collection and hundreds of pictures, manuscripts and other items. Chinatown - A Chinese settlement that has been in existence since Victoria's goldrush of the 1850's. Melbourne Concert Hall - The venue for a wide variety of performances including gala events and symphonic concerts. Parliament House - Houses the Legislative Council and Legislative Assembly. Sidney Myer Music Bowl - An open-air auditorium for events such as 'Carols by Candlelight'. Royal Botanic Gardens - One of Victoria's most popular attractions, featuring sweeping vistas, rolling lawns, elegant lakes and pleasant picnic areas. Guided and self-guided audio tours are available. Fitzroy and Treasury Gardens - Home to Cook's Cottage, J.F. Kennedy memorial, the Conservatory with its floral displays, a model Tudor Village and a dolphin fountain. National Gallery of Victoria - The focal point of an exciting variety of international blockbuster art exhibitions. It also hosts a rich Australian collection. National Philatelic Centre - Contains representations of culture including stamps, film, landscape photography, fine arts and crafts. Cook's Cottage - Commemorates the voyages of the famous Captain James Cook. Shrine of Remembrance - Commemorates those persons who served for Australia in the war. Victorian Arts Centre - The focal point of Melbourne's social and cultural scene. Features include performances of music, drama, ballet and opera. Knightsbridge Apartments - Specializing in Studio Apartments and Family Suites this accommodation in leafy green East Melbourne is only walking distance to the MCG, Melbourne Park & Melbourne CBD. City Edge Serviced Apartments - Offering quality 1 and 2 bedroom family apartment accommodation in East Melbourne City Edge is the ideal choice for the budget conscious traveller. Adara East Melbourne - These comfortable and contemporary boutique style apartments in East Melbourne are fully furnished and self-contained. Birches Serviced Apartments - The 1 and 2 bedroom apartment & townhouuse accommodation at Birches is close to East Melbourne's beautiful parks and gardens. Tribeca Serviced Apartments - For executive apartment accommodation just 1km from the Melbourne CBD stay in these luxury East Melbourne apartments.